Submitted by Brett Baker on March 5, 2013. 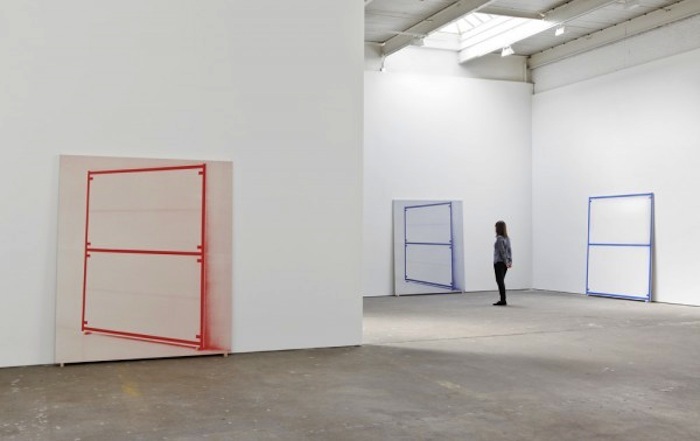 An exhibition of works by Alan Uglow is on view at David Zwirner, New York, on view from February 19 - March 23, 2013. "two pieces ended up being one piece, attracting one another across the room. They were like bodies, in a way, but it really brought the spectator into the piece; that was the reason why they had to be opposite one another." In the current show, perhaps the most compelling of these interactions occurs between two works on canvas of the same size, Standard #8 (Blue), 1994 and Portrait of a Standard (Blue), 2000. By pairing the first - an abstract painting whose flat forms are schematic and derived from markings observed on a soccer field with the second - a silkscreened canvas depicting a nearly identical painting photographed at an angle, Uglow creates a visual experience charged with the potential of both abstraction and representation. "In the next room, a large “Standard #23 (grey)” from 1998 stands against one wall on hardwood blocks, an aspect of Uglow’s installation that serves to enhance the object quality of the painting. On an adjacent wall, “Portrait of a Standard #3 (silver)” (2000), a photo-silkscreened version of a standard piece angled to the plane of the canvas, also stands on little hardwood blocks. The canvas and blocks provide information about qualities of the object that are missing from the silkscreened image, while the angled image of the photo-silkscreen exhibits properties that are both similar to and different from those of the painted object. Light reflecting off the silver silkscreened bands jumps out from the image at certain vantage points, and at others nearly disappears, but the implications of the artist’s position, as embedded in these works, require thought. Object and image are so fitfully intertwined in this constellation, any attempt to separate them becomes labyrinthine and begs the question of what it means to do so." Like all painting, Uglow's work can only truly be experienced in person, however, the video below, produced by the gallery, provides an online sense of these characteristic shifts between "object and image" Waltemath describes.